Introducing Thomas Warriner who plays “The Captain” – a French mercenary that the Sheriff has wrapped around his finger. This is Thomas’s first outing with BATS and we are pleased to have him as part of this amazingly talented cast. 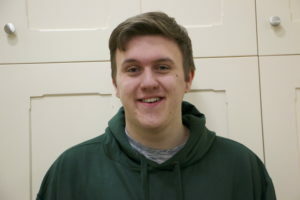 Brand new to BATS, Thomas joined late in 2018, after some BATS members saw him as Orin in his school’s production of Little Shop of Horrors. Living in Sandy, Thomas went to Alban Academy, and now Samuel Whitbread Academy, where he’s performed in all of the shows, concerts, and pantos. Performing with BATS will be a big step up in audience size, but Thomas is eager, if nervous, to rise to the challenge. Thomas can’t wait to work more with the funny, confident, and talented people of BATS. And, though new, is already proud to be a member of the family.